Should You Try Gamification for Your Event? Have you considered using a game at your event to boost attendee engagement and interaction? Even at serious business conferences and expos, gamification gets events hyped especially with emerging mobile event app technology. However, it is not easy to do it right — a poorly designed game can not only waste your effort but also do harm to your event. Then, what mistakes often make event gamification fail? Is there any game that is easy-to-do, super engaging, and proven to work at events — even business events? Whova has diagnosed common mistakes in current practices’ and deployed Whova’s new event gamification strategy, which has been a great hit at many events. 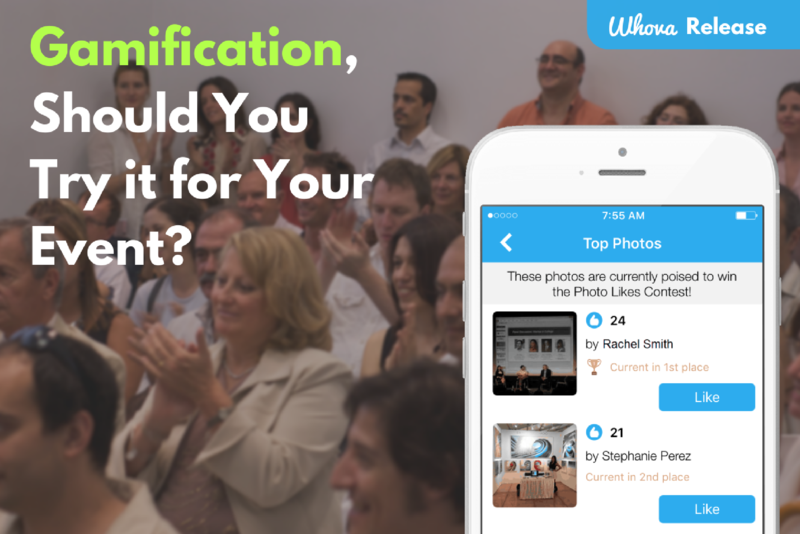 Gamification wasn’t Working at Your Event? #1. Don’t overdesign. Have an intuitive and non-time-consuming game. If a game is not very intuitive and simple, it’s not easy to get familiar with during the few days of an event. It’s also not easy to motivate them to participate neither unless there’s a big award for a winner. You need a simple and intuitive game that doesn’t even require to learn its rules and has an app interface. A good game also shouldn’t take a long time to complete as it might distract from the main activities at the event. #2. Scavenger hunt? Understand what your participants want first. Merely following what other events do for gamification can backfire. For example, while a scavenger hunt is often used to increase foot traffic at exhibitor booths, your attendees might want to spend time to explore new technology only useful for their business instead of visiting all the booths at your event, shaking hands, and asking for signatures. Similarly, your exhibitors may want to identify valuable leads who actually have interest in their products. The goal of a game should not be just increasing booth traffic but increasing meaningful interactions instead. #3. Don’t force attendees. Find a way to go viral. If you gamify your event in a good way, attendees won’t even sense that they’re playing a game because the actions required for the game is well-aligned with what they’re already doing (e.g. networking, learning, entertaining). A good game goes viral without much effort from an organizer. Therefore, you need to create an appropriate game and find a creative way to further spice it up, such as displaying activity on a big screen. Whova’s Photo Contest has been a great hit at many events such as Washington Annual FCS Conference – 2016, 59th Annual TCA Conference, and the Story Conference 2016. This type of gamification feature is self-explanatory. Attendees can take and upload a picture directly through the Whova event app and click the like button on any pictures; organizers can simply enable it on Whova web dashboard, describe the award for (a) winner(s), and send a reminder to attendees. Similarly, with the Whova’s Caption Contest, organizers can pick the most interesting caption on photos that attendees put on. The winners will be specified on the app and can be announced through a push notification. The Photo Contest and Caption Contest required no learning curve. Almost all people with smartphone know how to take pictures and many people who have experience in using social media know what the “thumb up” icon means. Taking a photo with group of people is already something people naturally do at an event. Even at a serious business event, attendees take photos of keynotes, venues, impressive exhibitions, and colleagues during a reception or dinner. Most importantly, it doesn’t require a long time to participate in and enjoy the game — attendees just need a few seconds to take a shot or click “thumb up”. That’s the reason why 200-300 exciting photos were shared on the Whova app at a majority of two-day conferences. Whova’s Live Event Slideshow displays the photos taken by attendees on a big screen in real-time by automatically pulling them from the app. The interesting pictures rolling on the big screen naturally motivated more attendees to participate in the photo contests. Organizers didn’t need to force attendees to participate — everything went natural and smooth. Regardless whether the goal of your event is networking or business, it is worthwhile to try a well-designed gamification at your event. 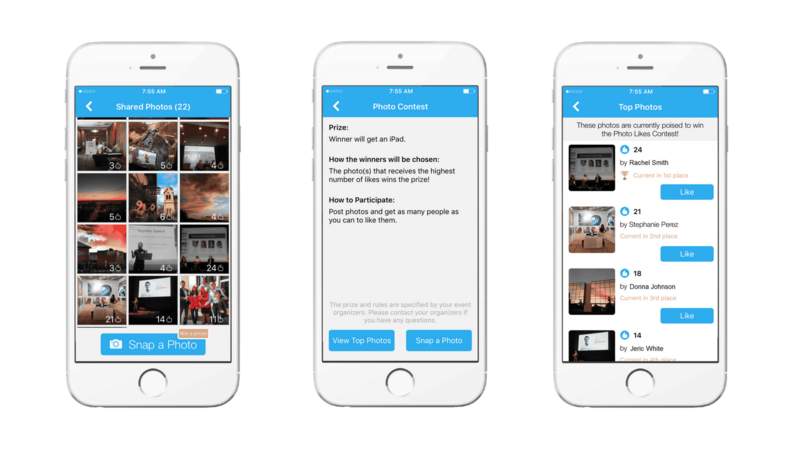 There is NO additional charge to use the Whova’s Photo Contest and Caption Contest features if you use Whova event app and/or Whova online registration. You can also enjoy many useful tools at free of charge, including the self-serve name badge preparation tool, onsite check-in, live polling, live event slideshow, web agenda builder, and speaker information collector. Contact us at hello@whova.com or request more information.